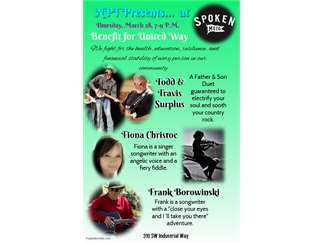 Join Bend Song Exchange, Non Profit Tunes and United Way of Deschutes County for a benefit concert - a night of free live music and raffles at Spoken Moto! Free event! All ages! We'll have raffle items TBA! And, we'll take home the tip jar. Spoken Moto will start off the tip jar with $100! Come join the fight to for the health, education, financials stability and resilience of every person in our Central Oregon community.